When the British summer delivers on the weather front, there’s nothing better than a music festival, (especially if you can find one serving champagne). Whether you’re looking for family-friendly festivals, extra-special small independent music festivals, or boutique options at your favourite dusk-till-dawn alfresco rave, we’ve rounded up the best of the year. 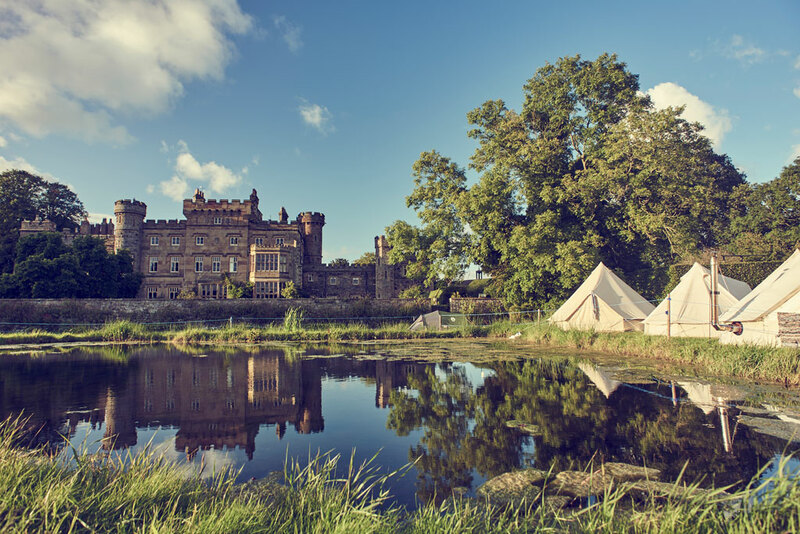 From black-tie dining to woodland spas, escape the welly-clad crowds at the best luxury and boutique festivals in the UK for 2019. Where to stay? Cowley Manor, Cheltenham, Gloucestershire. From the outside, it’s a stunning Italianate manor house in classical lake and cascade-filled grounds; inside, a flawlessly hip hotel, with 21st-century good looks. If you’re inclined to go walking, there are wellies by the front door, or bicycles for those who want to feel the wind in their hair. Although the restaurant, Malt, is a magnificent panelled room, the atmosphere is relaxed and the menus concentrate on honest, seasonal British food. Star of the show, however, is the modernist spa, C-Side, and its two pools. Contemporary bliss-out and stone grandeur, seamlessly blended. Cowley Manor has never looked or felt better. Doubles from £195. Where to stay? Bodysgallen Hall, Llandudno, Conwy. Bodysgallen Hall is a dignified, gentle paced island of calm, close to Llandudno’s famous promenade and beaches. Climb its tower, built as a lookout for Conwy Castle – the medieval core of the fine 17th-century mansion – and you’ll be rewarded with a panoramic view. The house has enormous character, with 15 antiques-filled bedrooms and 16 postcard-pretty cottages scattered around the estate’s 200 acres of wooded parkland. The former farmhouse now houses the spa with a large indoor pool, plus steam room, sauna and solarium. Doubles from £185. Where to stay? The Lamb Inn, Wartling, East Sussex. It sounds a bit fictional, The Lamb Inn at Wartling, like something from a TV comedy, which is fitting, since the owner is on telly himself, and full of humour too. On Antiques Road Trip, James Braxton nips round the country in an open-top car, searching for bargains, but this pretty corner of Sussex, overlooking Pevensey Levels, is home. When the village pub came up for sale, he and his wife bought and decorated it beautifully. It’s run by their sons, with good food courtesy of an equally young kitchen team. Charlie’s collection of vinyl records gets aired on a turntable in an alcove; milk churns double for stools along the bar; there are cosy and elegant eating areas, including a courtyard. Doubles from £95. The Grange Festival is an event series dedicated to performing world-class opera in the heart of Hampshire. This year’s line-up includes Le nozze di Figaro, Falstaff, Belshazzar and The John Wilson Orchestra. Book now at thegrangefestival.co.uk. Where to stay? The Wellington Arms, Baughurst, Hampshire. There’s something pretty special about ‘The Welly’. It’s a real foodies’ pub, owned and run with great charm by Simon Page (front of house) and Jason King (award-winning chef). Set in the countryside on the Hampshire/Berkshire border, it has a burgeoning kitchen garden and a field where hens, bees, sheep and pigs are kept. The dining room – there are just 12 highly prized tables – is delightfully informal. There are four bedrooms: the Apartment is a one-bedroom suite above the pub. Then, tucked away in a converted 17th-century, oak-framed hay store are two striking guest rooms, all exposed brickwork and timber beams, and outside a green oak barn, the Cart House. Doubles from £110. Where to stay? The Bingham, Richmond, London. This glamorous, intimate riverside hotel began life as two Georgian townhouses, later joined together by Lady Anne Bingham, a forebear of Lord Lucan. Crikey. Today’s owner, Samantha Trinder, ably assisted by brilliant general manager Erick Kervaon, has created a special place in which to stay and dine. Slick and contemporary, the hotel has the friendliest staff, a fun cocktail bar and a beautiful restaurant, a Richmond hotspot where natural modern British cuisine excels. But it’s the setting that adds the extra magic here, and the view. Doubles from £164. Where to stay? The Feathered Nest, Nether Westcote, Oxfordshire. Attractively laid out and furnished, it reflects the passion and professionalism of its owners, Tony and Amanda Timmer. The four countrified bedrooms (Cuckoo’s Den, Cockerel’s Roost, Pheasant Nest and Dove Cote) perfectly blend the practical with the luxurious, kitted out with Nespresso coffee machines, gleaming antiques, DVDs, books and magazines. And waking to the breathtaking view of the Evenlode Valley is guaranteed to soothe even the most frazzled nerves. In the rustic chic dining room or outside on the shady terrace, the modern British food is as impressive as the bedrooms. Doubles from £245. Where to stay? Hurley House, Berkshire. Hurley House is a newly refurbished boutique hotel with 10 beautiful bedrooms and an excellent restaurant. Think cosy country English pub styling with a luxe twist. Free-standing baths, worn leather armchairs and room one even has its own terrace for afternoon drinks in the sun (or, you know, English drizzle). The crowd is family-friendly and a mix of locals and the city crowd escaping for a night or two, while the restaurant is run by Michael Chapman, formerly head chef of Michelin-starred The Royal Oak at Paley Street. Hurley House is an easy-to-reach country escape that’s the perfect stop-over for a day in Henley, Marlow, Oxford and more. Where to stay? Hazlitt’s, Soho, London. Hazlitt’s is the real deal: as genuine, amusing and revealing a hotel as you could hope for, especially in seething Soho. It’s named after the radical essayist and master of English prose, William Hazlitt. As befits an establishment with such literary connections, the hotel is popular with authors, who leave signed copies of their works when they depart. The sloping, creaking floorboards have been retained and the rooms, decorated with antiques, busts and prints, are individually furnished, with splendid bathtubs and Victorian fittings in the bathrooms. Doubles from £269. Where to stay? The Chester Grosvenor, Chester, Cheshire. It could be the setting for a film, an upstairs-downstairs saga about a glossy, old-school hotel that’s set in a provincial city but aims ‘to match anything you might find on the Champs-Elysées’. And it certainly does. There’s the larger-than-life doorman, swathed in liveried coat, to greet and usher you into a lobby worthy of Claridge’s, with its vast staircase and glittering chandelier that once hung in London’s Junior Carlton. You’ll find a perfect example of a grande dame European hotel, glossy and plump. The bedrooms live up; the food in Simon Radley at The Chester Grosvenor is Michelin starred, and the shopping outside is to die for. Doubles from £170. Where to stay? The Wild Rabbit, Kingham, Oxfordshire. Just a few fields away from sister enterprise Daylesford, the organic farm shop, café, deli and Bamford Haybarn Spa – the wellness retreat of Carole Bamford, it draws well-heeled locals and weekenders in equal measure to meet, eat, party, chill and – if they want – bed down for the night in great comfort. The restaurant – think boho-chic farmhouse kitchen – lies behind, with its pewter-hung dresser, long wooden tables and busy chefs in view. Head Chef Nathan Eades is at the helm in the kitchen, with culinary delights available all day. This Wild Rabbit is sophisticated, convivial and informal and the 12 bedrooms and three cottages – symphonies in designer cream and taupe – are sanctums of rustic-chic. Doubles from £175. Where to stay? Artist Residence, Oxfordshire. There are five stunning bedrooms upstairs, plus a further three suites in the converted farm outbuildings and a cosy shepherd’s hut. Original features have been retained and restored; auction houses and reclamation yards scoured; modern art set against William Morris wallpaper. The restaurant features art by the Connor Brothers and their fictional character Mr Hanbury (a nod to the Mason Arms’ famously eccentric landlord Mr Stonhill), while the kitchen offers a hearty British menu using meat and dairy from neighbouring farms and the best seasonal produce from the kitchen garden. Doubles from £95. Where to stay? Congham Hall, King’s Lynn, Norfolk. Set in 30 acres of gardens and woodland, this calm, handsome Georgian house has a special feature: its acclaimed herb gardens, containing almost 400 varieties, plus orchards and kitchen garden. To either side is a drawing room and library, and there’s also a slick bar. The airy dining room works both for smart gatherings and relaxed, informal meals. The bedrooms are all impeccable and comfortable, divided between those in the house and those in the garden wing, next to the pampering Secret Garden Spa. The house rooms are cool and classical in style and make lovely havens in which to relax. Doubles from £135. Where to stay? Hannah’s, Winchester. Not many, if any, hotels are named after their owners, but then not many hoteliers are quite as much of a selling point as Hannah McIntyre. Not that she craves limelight – quite the opposite – but her youth (mid-twenties), warmth and enthusiasm do set the tone for her equally stunning guesthouse. Two things alone make it the current go-to address for this absorbing cathedral town, whether for visitors (she also serves afternoon teas to non-residents), bridal couples or honeymooners: it’s got wow factor and Hannah is committed to doing the finest possible job. In a former livery, then dancehall, a huge arched front door leads into a lofty, dramatic living space, complete with antique piano, sofas around a wood burner, bookshelves and honesty bar. The three exciting bedrooms have huge comfy beds and baths on mezzanines reached by almost vertical wooden steps. Hannah’s breakfasts are special and her B&B an unalloyed delight. Doubles from £185. Where to stay? Barnsley House, Cirencester, Gloucestershire. If you dream of somewhere not too large, but not too small, somewhere effortlessly chic yet close to nature; if you fancy a hotel with a discreet spa, an intimate cinema and a famous garden, then look no further than this gorgeous Cotswold retreat. No two bedrooms are the same, but all are cool and comfortable, blending classy furniture and state-of-the-art facilities that blend with traditional elements like old beams, stone fireplaces and wooden floors. As for the lovely Potager Restaurant, elegant, fresh and unfussy food is served in a cleverly mirrored white and cucumber green room, which leads to a pretty terrace overlooking that entrancing garden. Doubles from £209. Where to stay? Howard’s House, Teffont Evias, Wiltshire. Built in 1623 from attractive mellow stone and tucked away in an unspoilt Wiltshire village deep in the Nadder Valley, Howard’s House blends into the landscape, reassuringly timeless and quintessentially English. A hotel since 1989, it offers an oasis of calm away from the bustle. In the glorious flower-filled garden, protected by an old topiary hedge, and with a lovely terrace and croquet lawn, the only sounds you’re likely to hear are birdsong and the knock of mallet on ball. Head chef and co-owner Nick Wentworth uses only the finest, freshest seasonal ingredients, skilfully combining them to release their true flavours in delicate, imaginative dishes. Doubles from £190.